A story based on the Three Little Pigs fairy tale has been turned down by a government agency's awards panel as the subject matter could offend Muslims. The digital book, re-telling the classic story, was rejected by judges who warned that "the use of pigs raises cultural issues". Becta, the government's educational technology agency, is a leading partner in the annual Bett Award for schools. The judges also attacked Three Little Cowboy Builders for offending builders. The book's creative director, Anne Curtis, said the idea that including pigs in a story could be interpreted as racism was "like a slap in the face". The Three Little Cowboy Builders has already been a prize winner at the recent Education Resource Award - but its Newcastle-based publishers, Shoo-fly, were turned down by the Bett Award panel. The feedback from the judges explaining why they had rejected the CD-Rom highlighted that they "could not recommend this product to the Muslim community". They also warned that the story might "alienate parts of the workforce (building trade)". 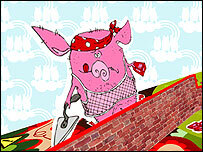 The judges criticised the stereotyping in the story of the unfortunate pigs: "Is it true that all builders are cowboys, builders get their work blown down, and builders are like pigs?" Ms Curtis said that rather than preventing the spread of racism, such an attitude was likely to inflame ill-feeling. As another example, she says would that mean that secondary schools could not teach Animal Farm because it features pigs? Her company is committed to an ethical approach to business and its products promote a message of mutual respect, she says - and banning such traditional stories will "close minds rather than open them". Becta, the government funded agency responsible for technology in schools and colleges, says that it is standing by the judges' verdict. "Becta with its partners is responsible for the judging criteria against which the 70 independent judges, mostly practising teachers, comment. All the partners stick by the judging criteria," said a Becta spokesman. The reason that this product was not shortlisted was because "it failed to reach the required standard across a number of criteria", said the spokesman. Becta runs the awards with the Besa trade association and show organisers, Emap Education. Merlin John, author of an educational technology website which highlighted the story, warns that such rulings can undermine the credibility of the awards. "When benchmarks are undermined by pedestrian and pedantic tick lists, and by inflexible, unhelpful processes, it can tarnish the achievements of even the most worthy winners. "It's time for a rethink, and for Becta to listen to the criticisms that have been ignored for a number of years," said Mr John.